The market took a break today from making new highs but we could be seeing some sort of rising wedge, so I wouldn't discount the possibility of higher highs before another test of the Trend Average. The GDP growth numbers that came out today blew past expectations and are supportive on an ongoing bull market, still I still think the rate of appreciation has gotten ahead of itself. So sooner than later, the market will reset itself again. Also, China's market has finally broken out of a multi-year resistance channel so we might see money flowing that way from profit taking in the US in the next few months. That market is still cheap relative to its history and other major stock markets in the world. 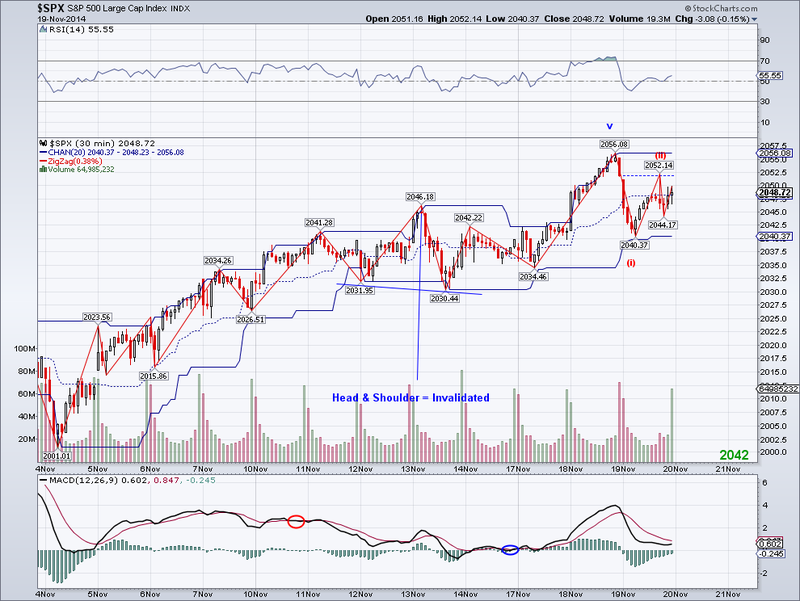 The market seemed to follow through somewhat on the micro count posted, but the ideal would be another high before starting the correction. After rallying for over a month non-stop, the market really needs to take a break from all this unjustified euphoria. It almost seems like bears have capitulated at this point as they're nowhere to be seen. 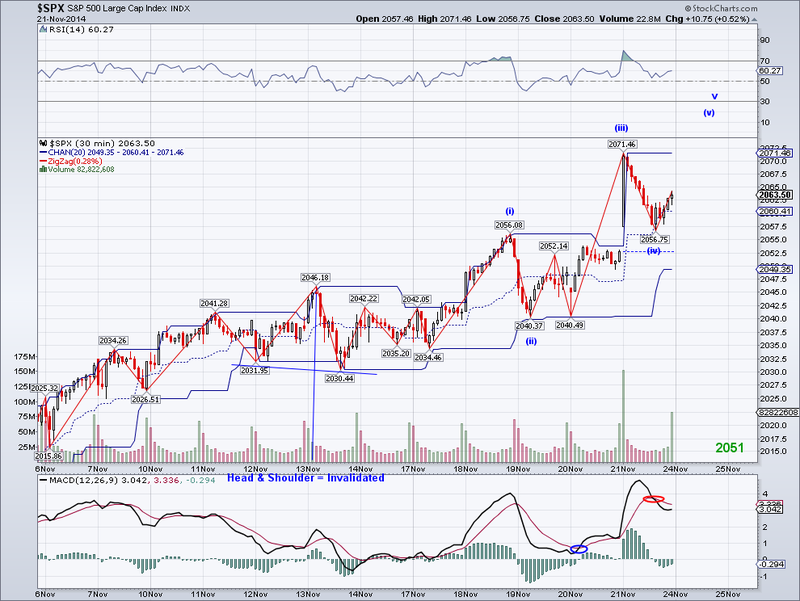 The bulls showed up once again to invalidate my bearish labels and we got a substantially higher high today. So the seemingly correct count was the bullish 1-2 micro count and we obviously got the W3 this morning, which implies at least one more high early next week. I just hope these waves won't overlap again as they have been doing in the last 2 weeks as it makes them hard to predict. Perhaps this new ATH will be the Head of an H&S formation? I am in pain now over my uncovered hedge but at least my long shares are doing very good, so I'll just continue to wait this out until I can exit the short position. Isn't it amazing the market has now rallied 14% just because it was overbought? Next time the market gets very oversold, remember this particular rally. Oscillators were clear to me few weeks ago that a strong bounce was coming, but this rally has gone way above my most bullish expectations. 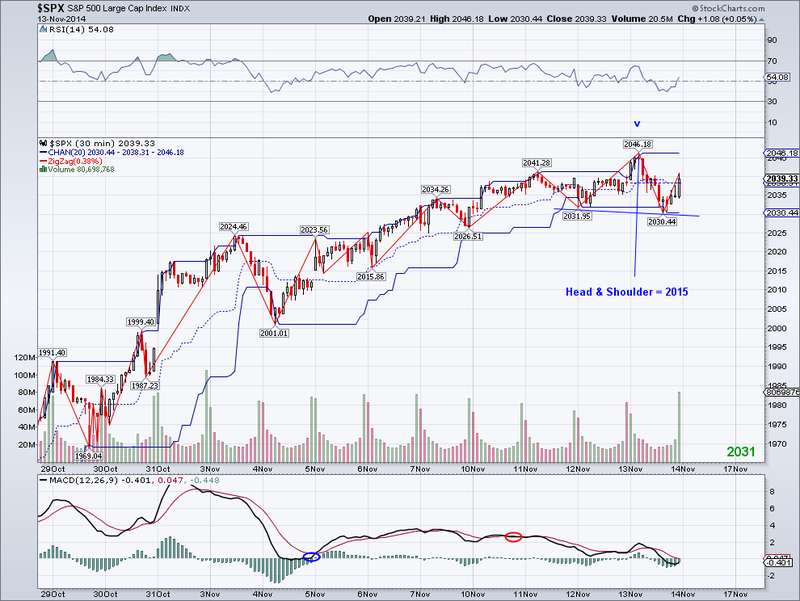 The market ended bouncing right off support early morning but the bearish micro count is still in place. So if this count this correct, we need to see one strong sell off starting tomorrow. I normally don't like to add bearish labels to a bullish trend but this wave is getting ridiculously overstretched. I am still holding to my positions, so hopefully I'll get to sell hedge sometime soon. Today we got a bearish wave early in the morning from 2056 to 2040 that might end up being a bearish micro W1, so we'll see if the market finally decides to correct. 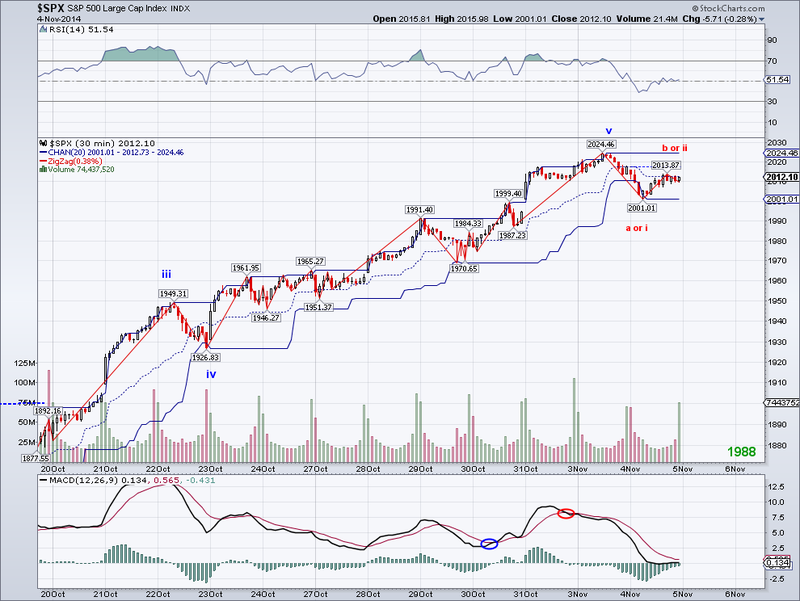 If this is a micro bearish 5 count, I am looking at gap support as the initial target at 2015. And obviously, if prices go above 2056 then the bearish count gets invalidated and instead we'll see some sort of bullish triangle or even a nested bullish 1-2. 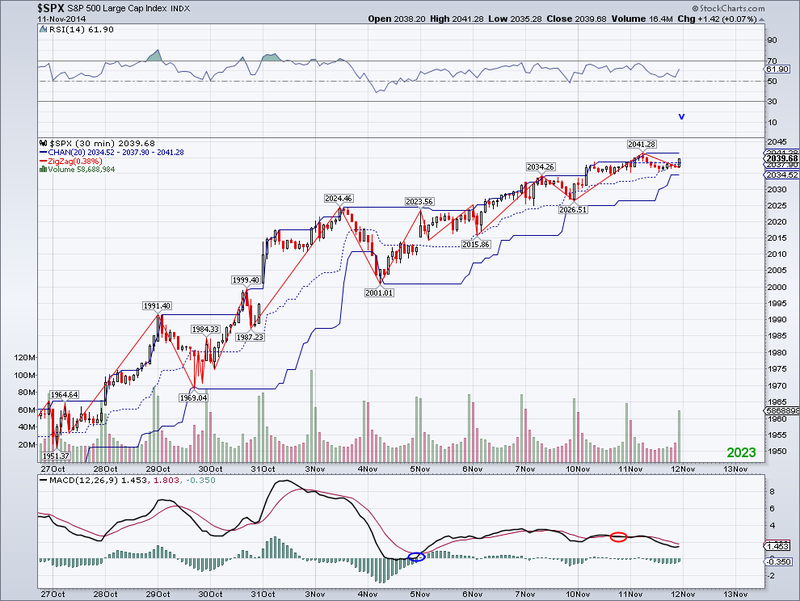 But at these levels and after this long rally, I think the probabilities are slim. 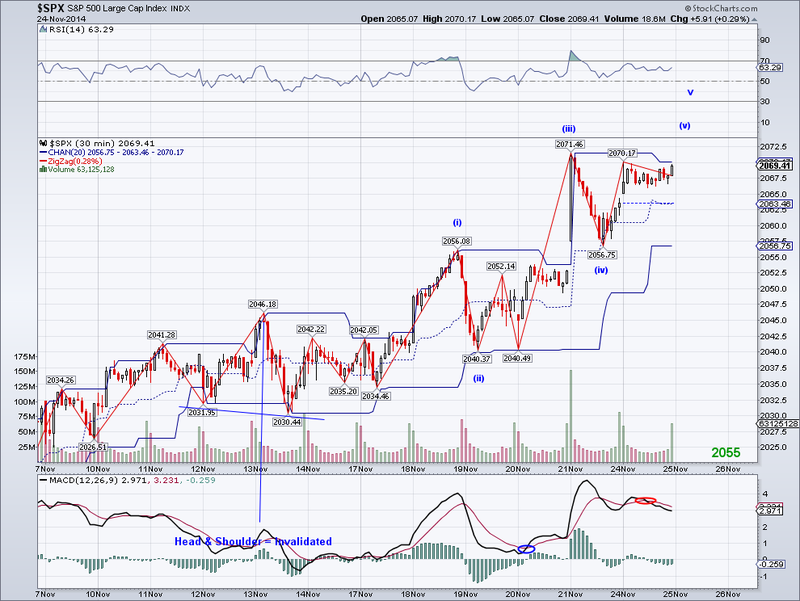 Also, I wanted to follow up on the 2400+ target for the market if we are indeed witnessing the start of the final LT Int 5th wave. If the market gets to that level, chances are very high that a significant top will be in as any more significant upside will likely result if some sort of crash. 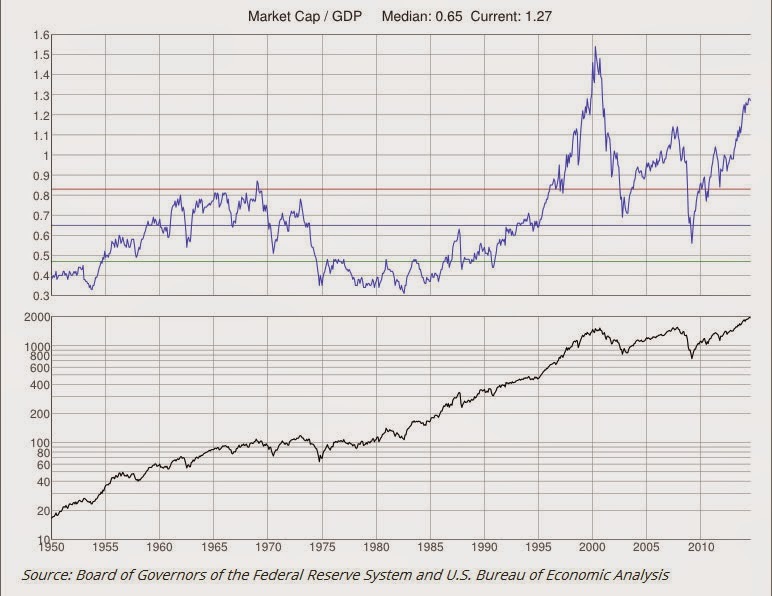 The reason I say this is because the US market has never been more than 150% of GDP for long and while it could go higher, it would be the first time in history the market would be that overvalued. The following graph speaks for itself. So 2015 might be the end of the bull market as we know it. History and the LT count supports this scenario, so should all major trends turn red next year (LT trend has been bullish for almost 3 years), it will be time to finally go net short in the US or at least wait for a while before getting back in. 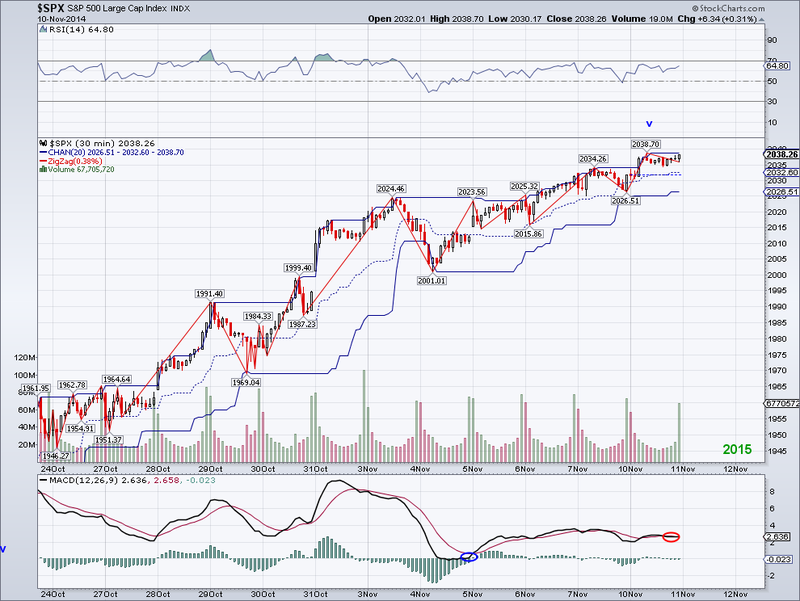 The market finally broke out of range today by making a somewhat substantially higher high. 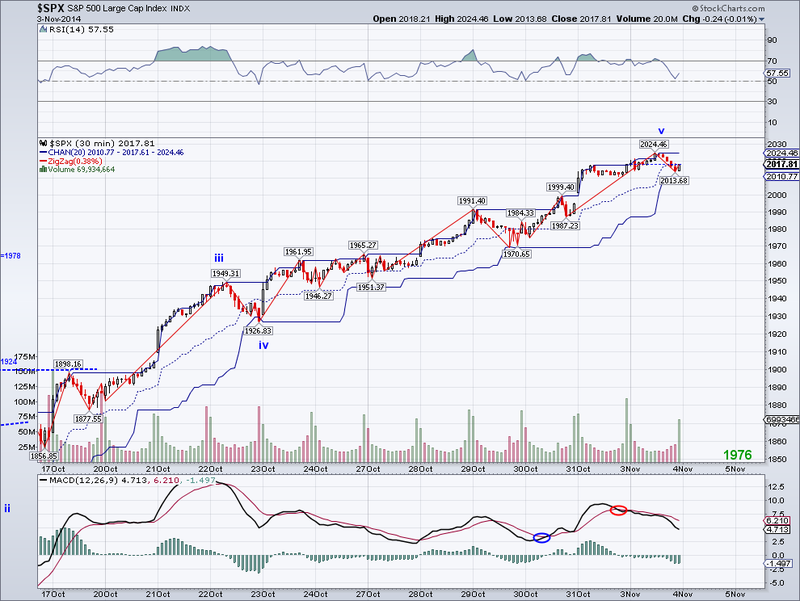 And assuming today's wave was some sort of micro W3, there is still more upside to come with a micro W5 ending around 2060. 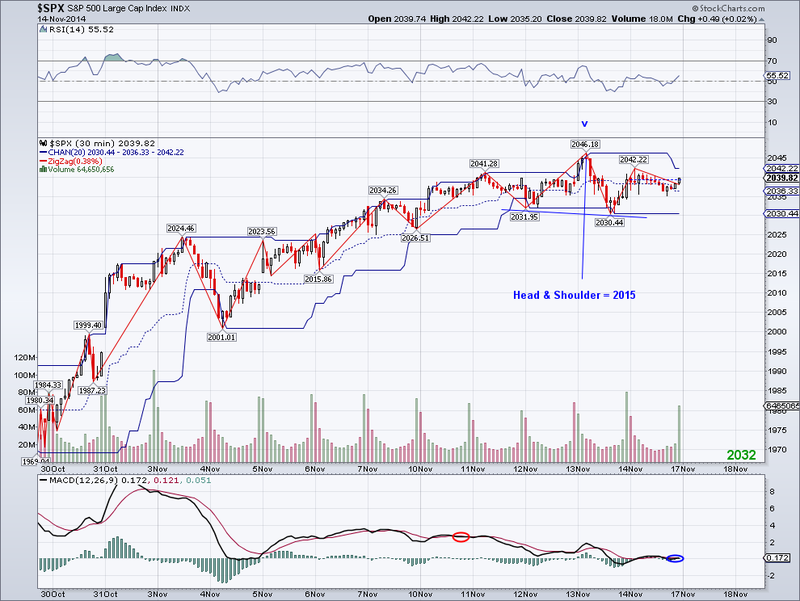 Trade below 2046 would invalidate this potential micro count and perhaps signal the start of the real correction. 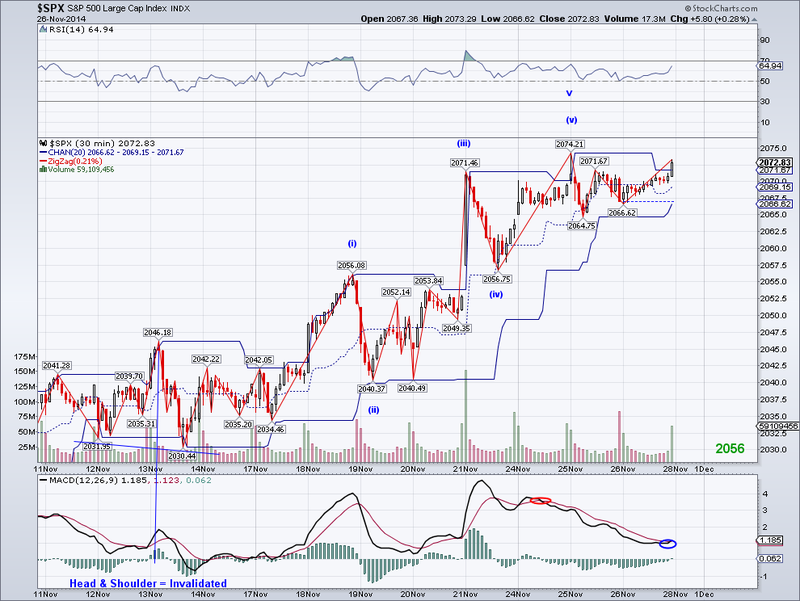 Also, looking at how far this wave has traveled, if the wave from 1821 is a W1 and ends around 2060 then we're looking at a target of 2400. Which at the point will probably be the actual top of the entire long term wave from the 666 low in 2009. Isn't it crazy just how far and how fast the market has come in just 5 years? 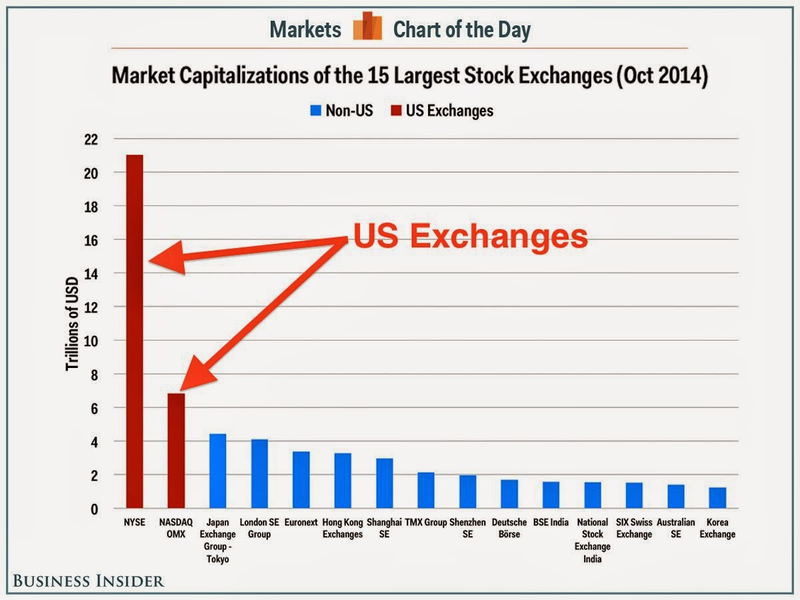 To illustrate just how big the US market has become. Look at the graph posted below. The US is a $17 trillion economy, while China is a $10 trillion economy and Japan $4.5 trillion. Usually, stock markets hover around 100-120% of its total economy. 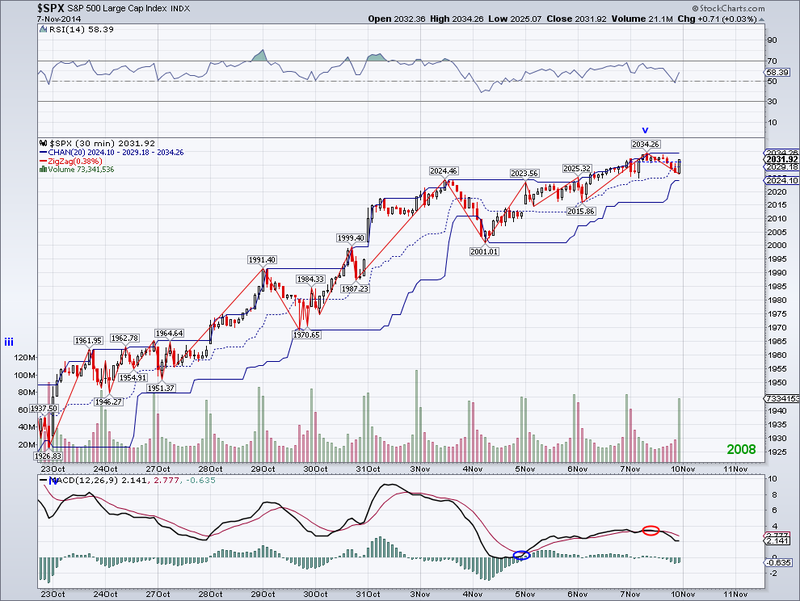 So if 2400 is reached, I am pretty sure there will be some serious adjustments coming. Not much to add today given the same boring pattern as last week. This despite the -10 point move in pre-market due to a surprise negative GDP number in Japan and its now official recession. I am not sure if the market plans to drop soon or it is just buying time to set up another bullish leg at this point before finally correcting. The Trend Average will be catching up to the market in the next couple of days and that normally signals a substantial move either way. This has to be the most boring 2 weeks in the market in the last 5 years. Despite having 5-6 new all time highs since 2021 broke couple of weeks ago, the total advancement has only been 1%. 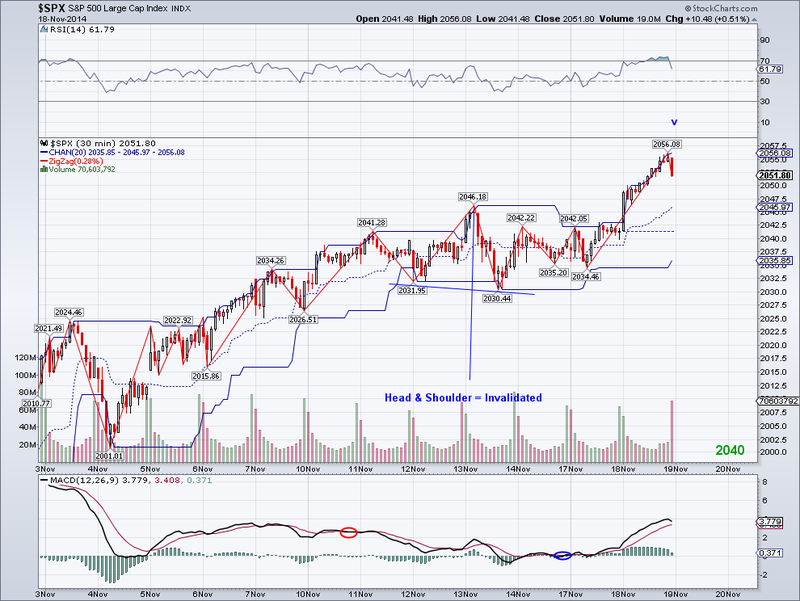 But at least the high from yesterday has held and the H&S pattern is still in play. So maybe we'll see some excitement early next week with a sell off or the beginning of another bullish leg. Also, I wanted to clarify the 5th wave label I have on the chart since I saw confusion over it. 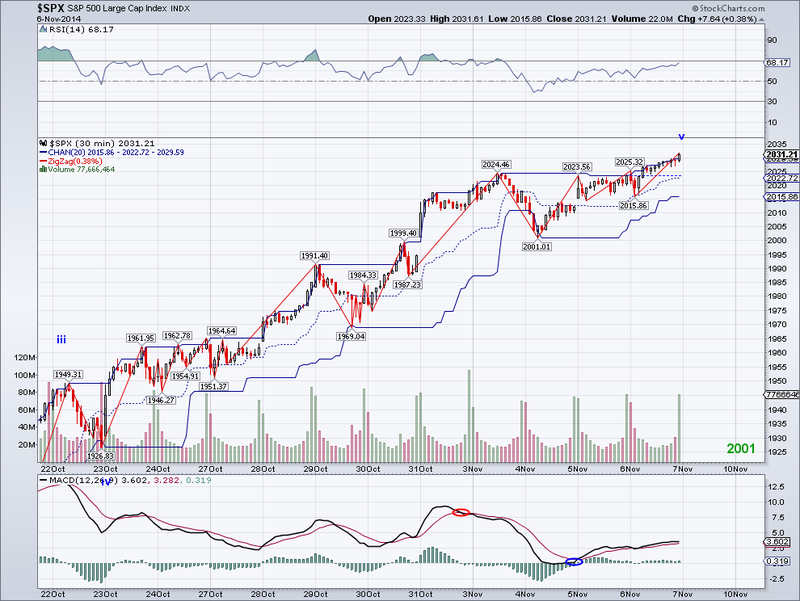 Basically, I see it as the last leg of the structure from 1821 but that doesn't mean it can't go higher. Usually, short term waves are more predictable when they have clear 5 wave micro counts to them and not overlapping counts like the ones we're seeing. That's why I haven't bothered to count the waves within this 5th wave as there's little predictive value to them. So the V label shouldn't be interpreted as a call for a top but as the actual label for the wave. 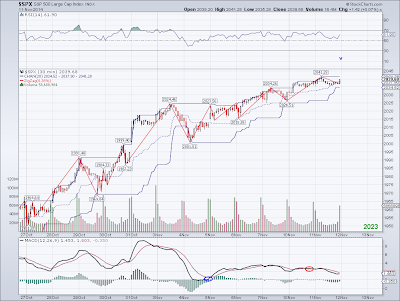 If I felt this was "the top", I would be selling my long positions and not stay hedged. The market put in another all time high today but this time early gains were reversed to support (finally tested its Trend Average after rallying for 3 weeks) before ending the day mildly positive. 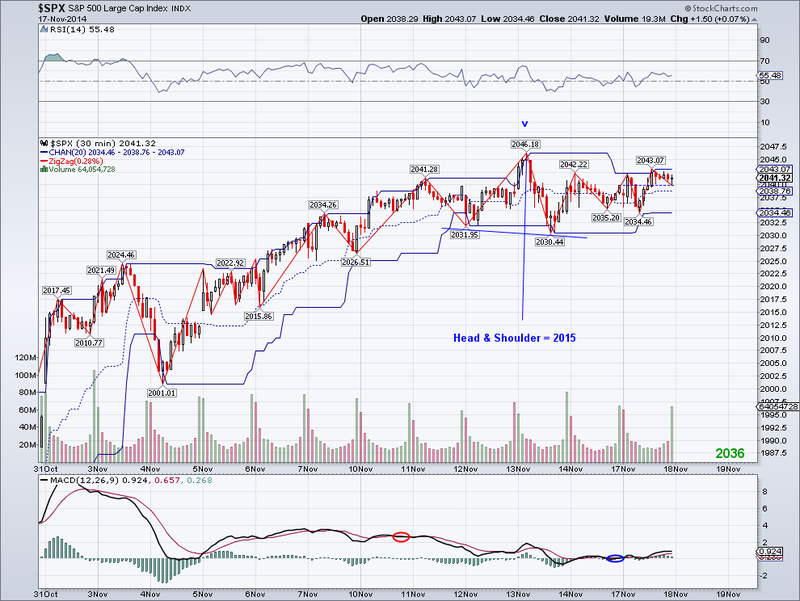 Since the market bounced right at support, now we have a possible Head and Shoulders pattern targeting 2015. Not exactly a "big" correction by any means, but perhaps the beginning of a multi-week correction. 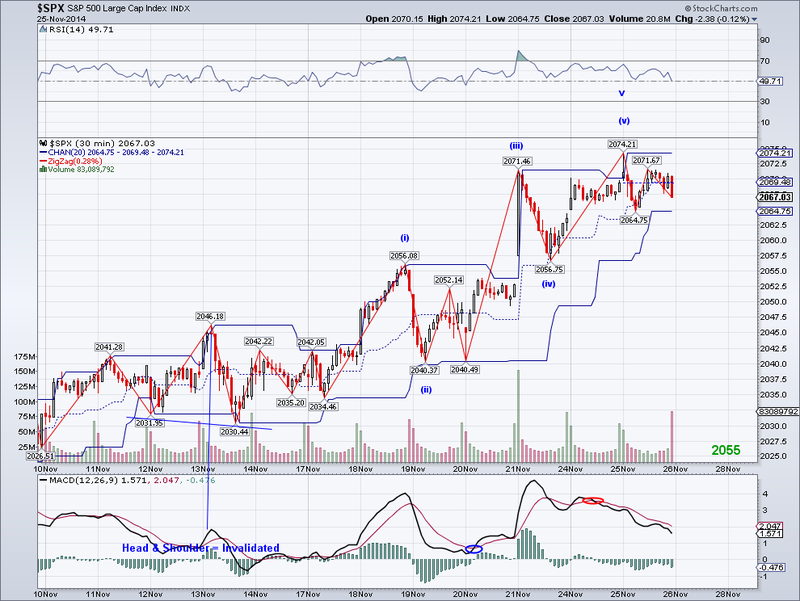 With that said, the correction today could be a W4 so until the TA is lost, a top is not confirmed. Today is the first "negative" day after 5 consecutive all time high days, which we have never seen since the market started making new early ATH last year. The wave count looks complete and at least very close to completing and I see the potential of a rounded top as long as 2041 holds. So maybe we'll get more excitement in the next few days. Maybe the Russian invasion of Ukraine will do it or some renewed bearish interpretation (in itself, ridiculous) of low oil prices? We got more of the same slow bullish grinding today to yet another new all time high. It's actually starting to get boring! Bears are nowhere in sight, they are simply scared to short or have given up after being screwed by these violent bullish rallies in the last two years. 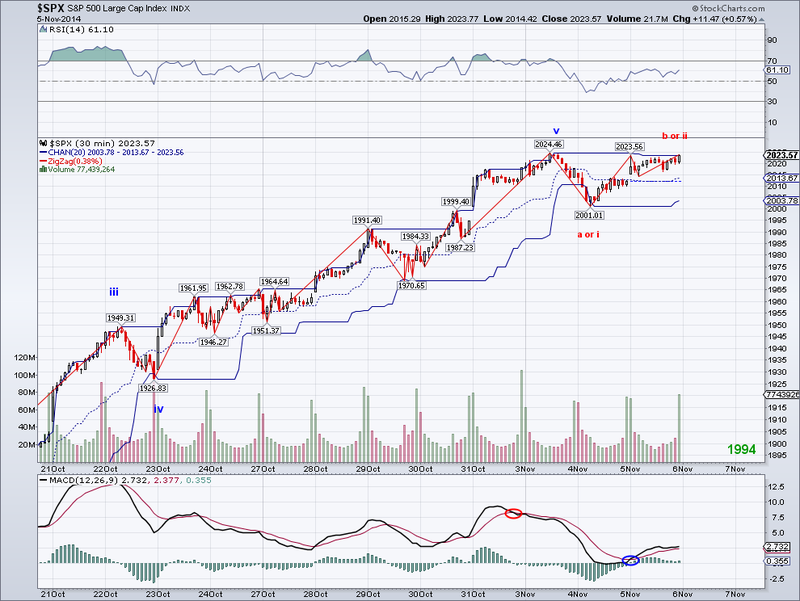 But as I've been saying in the past few updates, momentum is waning and a correction should come soon. I'm assuming traders that missed the rally will be looking at the 50 DMA to jump back in, which is currently at 1972. However, a proper fib correction points to at least 1958 (38.2) as the minimum retrace, so perhaps we'll get a little of panic between now and the end of the month and prepare the market for a big December rally.. and allow me to sell my hedge for a profit! Another low volatility day and another marginally higher all time high. 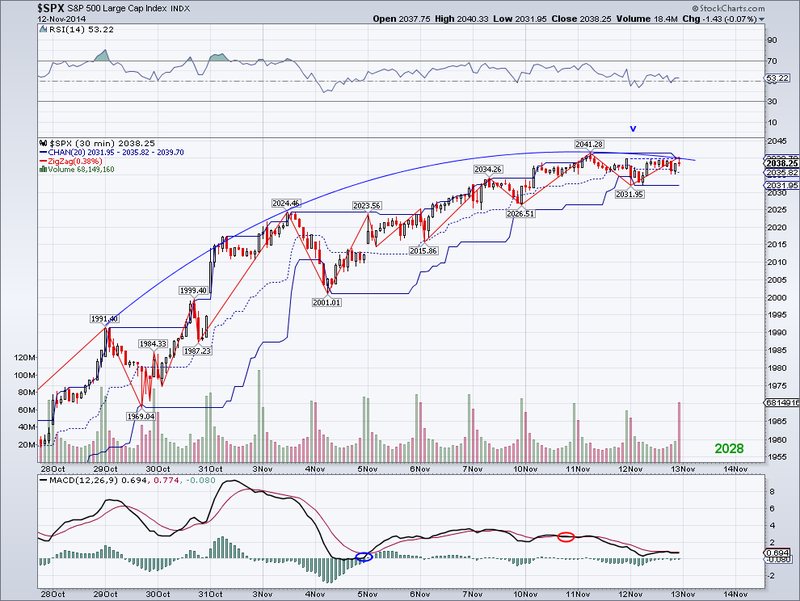 But the market has a rising wedge pattern and the correction should come in the next few days. I just wonder who in the world is buying right now given the 11% non-stop rally. I am still holding to the hedge, so hopefully the correction will make it down to a profitable level. Another day, another all time high. It seems like the market can only go up! But again, just like I turned bullish when there was panic. I now favor a correction given how far this rally has gone without a pullback. Technically speaking, the only reason we got this violent rally was because the market was oversold. So next time we get some panic selling, remember how quickly things can turn around even in the absence of any good news. The market has continued to slowly grind its way to new all time highs. But without a decent pullback, buyers should exhaust sooner than later. There are some divergences among the main indexes and the market is obviously overbought, so in a "normal" situation we would see a correction in the next few days. However, given how manic buyers have become, this could continue to go on for a long while. This is the exact opposite of the panic from just 2 weeks ago, and what makes the past few weeks interesting is that all those excuses that caused the panic selling are still there. I am keeping my positions and now I'll have to position trade my hedge as the TA has now risen past my shorting price. We had post-election rally today that came short of making a new all time high on the SP500, although the DJIA made a new all time high. So, the pattern of very shallow pullbacks might be repeating itself. 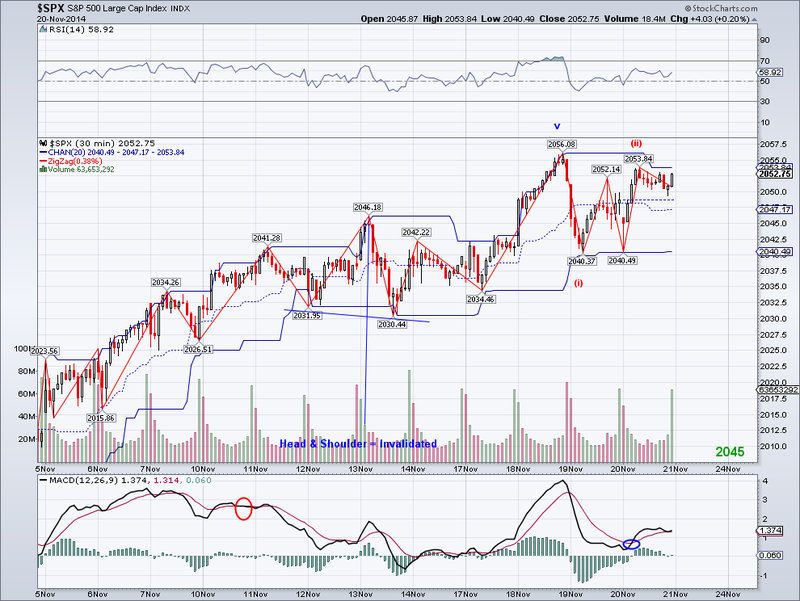 At this point the market is clearly overbought and euphoria has taken over, but momentum is starting to wane and there are some divergences in short term oscillators that favor a bigger pullback in the next few sessions. But I am keeping my positions intact for the time being. The market started another correction today as I had been hoping but it's not certain if we will get follow though selling. Since the market started rallying couple of weeks ago at 1821, there has 6 similar corrective waves and not one of them evolved into a Zig Zags. So if the market manages to put in another lower low tomorrow, it will be the first "proper" corrective wave after this 10% rally. The headlines today focused on Oil's sell off, which finally reached the $77 level I had in mind for weeks (if not months), so we might see a counter rally there if $75 holds. Also, I am finally seeing some reasonable analysis on how beneficial the price of oil is to the US and other major economies as opposed to the bearish arguments few weeks ago. This drop in price is mainly due to the supply side, and $1 less at the pump translates into few hundred dollars per driver in the US every few months, so it is equivalent to an economic stimulus. I read an analysis today on the impact of $80 oil that predicts the US will see an additional 0.4% in growth in 2 years and almost 1% in China. And the more the world economy grows, the better we all live and the higher the markets go. The ones that get screwed are the oil producing countries and oil companies. I am still holding to my hedge, so hope we'll see the 50 DMA tested to get out of it even or with a small profit. All the major indexes put in an intraday all time high with the exception of the RUT and this strengthens the bullish case for the next few weeks. I still expect a correction starting as soon as tomorrow if the high can hold but it could now just be a shallow pullback to the 50 DMA before the start of another bullish wave. The Nikkei is rallying almost 4% tonight, on top of the 5% from last week so if the sentiment carries over, then we could see the markets in the US rally non-stop for a while.